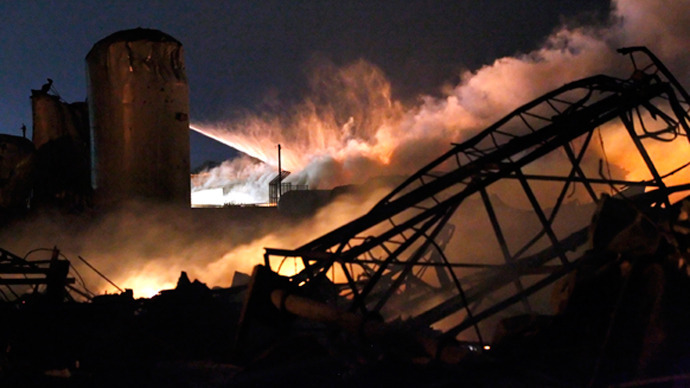 A massive explosion has rocked a fertilizer plant near Waco, Texas. Dozens are feared dead and more than 160 were injured in the disaster. Rescuers have to deal with toxic fumes contaminating the neighborhood. The explosion occurred Wednesday around 7:50pm local time [00:50 GMT Thursday] in the town of West, north of Waco. A fireball of nearly 30 meters high has been reported along with a massive power outage. The blast followed a fire at the plant, which is thought to have started in an anhydrous ammonia tank before spreading to the buildings at the plant. CBS 11 claims none of the plant’s employees were on duty at the time of the explosion. “Things just blew up,” the owner of the fertilizer plant in West reportedly told the channel’s Ginger Allen. There is no official fatality count yet. Police reported that between five and 15 people are estimated to have been killed, including the firefighters responding to the initial fire at the plant and a law official. Dozens are feared to have died in the disaster. Speaking to USA Today on Thursday, West mayor Tommy Muska believes more than 30 people, including 10 first responders, may have died. That number has not yet been confirmed by local, state or federal authorities. The neighborhood itself sustained significant damage, with buildings close to the explosion literally leveled. The Department of Public Safety reported that 50 to 75 residences have been damaged in West. DPS spokesman DL Wilson compared the scale of destruction to the wartime Iraq and the 1995 bombing of the Albert P. Murrah Federal Building in Oklahoma City. More than 160 people have been confirmed to be taken to hospitals, police reported. At least 24 patients were earlier said to be in a critical condition. Most of the injuries were from cuts, bruises and broken bones from the debris, authorities said. The blast wave shattered glass and sent objects and people flying. There are also patients with respiratory problems. Medical officials say high winds in the area made the use emergency helicopters to transport patients difficult. Rescuers are doing house-to-house search in the area. The number of casualties may rise as the rescue operation continues. West's EMS director told local KTVT late Wednesday night that he, a doctor, and Justice of the Peace are getting set to"pronounce many people dead" at the scene. Among other chemicals, the West Fertilizer Plant was using anhydrous ammonia, a colorless toxic gas, which is liquid under pressure. When concentrated it is corrosive to tissues upon contact. Its safety service guide reads that exposure to ammonia in sufficient quantities can be fatal. Anhydrous ammonia becomes highly explosive when mixed with gas and/or air. Containers with anhydrous ammonia are prone to explosions when heated, while ruptured cylinders may rocket. The plant reportedly stored about 25 tons of the chemical. The authorities have evacuated the northern part of the town, which had a population of 2,674 at the 2010 census. The town is located 30 km north of Waco, Texas, and 110 km south of the Dallas/Fort Worth metropolitan area. Roughly 150 survivors from a damaged nursing home, who were feared dead in the first hours after the explosion, were sent to a community center outside of town. The football field that was being used as an emergency command center and helicopter landing pad has been evacuated due to fears of a second explosion. Authorities consider the entire area a crime scene, although police say they have no indication so far that the blast was maliciously caused. The ATF has been called in and is to start its investigation in the town as soon as the area is deemed safe. Unconfirmed reports say a helicopter was damaged in the disaster area, with Waco police trying to validate this information. First responders requested a bomb squad to investigate a pervasive scent of flammable chemicals. Multiple barns in the area were engulfed in flames. One witness told the Waco Tribune "every house within about four blocks is blown apart." The local middle school was also on fire, but luckily it was not in session at the time. Firefighters are being kept away from the still-smoldering plant to extinguish the remaining fires due to safety concerns, the DPS reports. Toxic fumes are rising from the site. West Mayor Tommy Muska told residents to stay in inside because of the hydrous gas still in the air. Police say their evacuation plans may be altered or broadened depending on the weather conditions and the severity of the chemical threat. A disaster of this scale at a chemical plant poses serious contamination danger, although without radiation, nuclear safety expert Robert Jacobs told RT. The US Chemical Safety Board said it is deploying "a large investigation team" headed by a regional office director to investigate the causes of the blast. West Intermediate School, which is located near the fertilizer plant, had to evacuate the students and personnel in February after a fire was spotted at the plant. Later it was established that the alarm was due to controlled burning of pallets and brush at the plant, of which the school had not been notified. The factory was also investigated in 2006 after a complaint over a strong ammonia smell coming from it, according to records. The Environmental Protection agency fined the owner for $2,300 over failing to implement a risk management plan meeting federal standards. At the time the company assured the agency that the worst possible scenario of an accident at the plant would be a 10-minute release of ammonia gas that would kill or injure no one, according to The Dallas Morning News.